​Scripture References: Deuteronomy 34:3; Joshua 2:1, 3:16, 4:13, 24:11; 1 Kings 16:34, 2 Kings 2:4-5, 15; Matthew 1:3, 5, 20:29; Mark 10:46; Luke 19:1; John 12:13; Hebrews 11:30. It is possible to interpret this teaching through more than one lens or perspective. First might be the lens of you as a person, or from the perspective of your family, or possibly applied to your ministry or call, or perhaps viewed through the lens of your city or nation. As always, it is wisdom to ask the Holy Spirit to translate the message for you. As Moses finished his journey through the wilderness and released leadership to Joshua, Jericho was the chosen city of destiny. 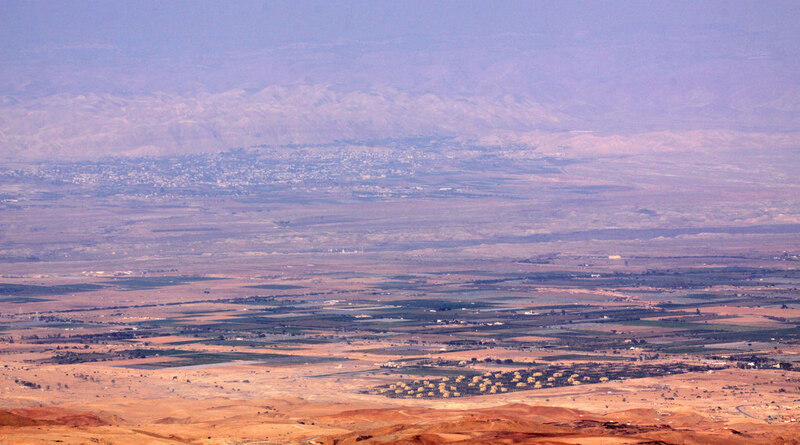 Deuteronomy 34:3 indicates that Jericho is across the Jordan River, due south in the valley. Jericho is a city that is surrounded by walls, well guarded and known as the city of palm trees. The word palm is translated to “tamar” in Hebrew. There are three women in the Bible with the name of Tamar. King David’s daughter was named Tamar. Absolom’s named his daughter, Tamar after his sister. And Judah’s daughter-in-law was also named Tamar whose name is recorded in the lineage of YESHUA in Matthew 1:3. Where you finish has greater weight than where you began. What you do with the gifts that GOD has given to you is YOUR gift to GOD! Before crossing over into the promised-land a team of twelve went to spy out the land and we are reminded of the familiar Bible story of ten men who saw giants and two men (Joshua and Caleb) who saw promise. It is about perspective. Do you see the promise, or do you see the giants? In Joshua 2:1, two men are sent into the city to spy secretly. They went to a harlot’s house and lodged there. Rahab’s family came to salvation through her willingness to serve ADONAI’s people. Matthew 1:5, places her in the lineage of YESHUA, as the mother of Boaz. God not only decided the geographical location of the promised land, but also what would have to be accomplished to take it. Once again, God parted the waters so the people could cross over. Joshua 3:16 reads, “That the waters which came down from above stood and rose up upon an heap very far from the city Adam, that is beside Zaretan: and those that came down toward the sea of the plain, even the salt sea, failed, and were cut off: and the people passed over right against Jericho.” God always makes a way for HIS will. Always. It is essential to cooperate with the plans of the LORD. Cooperating with GOD does not guarantee comfort and pleasure. Sometimes it requires warfare as Joshua 4:13 indicates that approximately 40,000 men prepared for war to walk in obedience to the LORD and willingly to go to battle on the plains of Jericho. Sometimes we must stand for truth! Sometimes we must use our voice and speak the truth so that others may hear. God holds us responsible for the action we take, for the words we speak, for the thoughts we think, and for our silence. Joshua 24:11, “And ye went over Jordan, and came unto Jericho: and the men of Jericho fought against you, the Amorites, and the Perizzites, and the Canaanites, and the Hittites, and the Girgashites, the Hivites, and the Jebusites; and I delivered them into your hand.” GOD will deliver the Victory in HIS Battles. Each of us has "ites" in our lives, however, it is not wisdom to strike up a battle without GOD’s protection, provision, providence, wisdom and leadership. God will provide a way to deliver you from any "ites" in your life. Ask HIM. After the city was taken and the enemy was destroyed, 1 Kings 16:34, tells us that the foundation was laid, and the gates were established. Every city of the LORD has a foundation and gates with Jesus Christ as the Cornerstone of every foundation and the Keystone of every gate. The enemy must be destroyed before a foundation can be put into place. Too often we ignore the enemy, pretend it doesn't matter, look the other way...the parable remains true...we all become like those we spend time with. Elijah and Elisha came to Jericho. 2 Kings 2:4, “And Elijah said unto him, Elisha, tarry here, I pray thee; for the LORD hath sent me to Jericho. And he said, As the LORD lives, and as thy soul lives, I will not leave thee. So, they came to Jericho.” One characteristic of a true prophet is that he or she will not leave what the LORD has given them to do. They clearly hear the voice of GOD and walk in obedience no matter what. A true prophet will lead others to the will of God for their lives. Elijah was taken to heaven in the whirlwind of fire near the city of Jericho. 2 Kings 2:5, “And the sons of the prophets that were at Jericho came to Elisha, and said unto him, ‘Do you know that the LORD will take away your master from you today?’ And he answered, Yes, I know.” Are you one that believes in miracles, prays for miracles, expect miracles? Are you a walking miracle and testimony to the overt kindness of GOD? As Elisha had asked, he received the double portion mantle of Elijah. 2 Kings 2:15, “And when the sons of the prophets which were to view at Jericho saw him, they said, The spirit of Elijah rests on Elisha. And they came to meet him and bowed themselves to the ground before him.” It is important to note that Elisha asked. Sometimes receiving means asking GOD. When Jesus Christ of Nazareth departed from Jericho, a great multitude followed him (Matthew 20:29). Who do you follow? Who is your leader? ​There were many healed in the city of Jericho and Mark records in 10:46 that Bartimaeus, the son of Timaeus was healed. Do you anticipate the healing virtue of Jesus Christ will touch you? Luke 19:1 tells us that JESUS ministered in Jericho at the home of Zacchaeus, the tax collector. The ministry of Jesus Christ included unconditional love for all. He did not mimic, agree or join their lifestyles, instead He gave them a choice to be transformed. As the walls came down in the days of Joshua and the people shouted and praised unto the LORD. Hundreds of years later people praised the miracles of Jesus Christ, Our Messiah. Do you expect walls to come tumbling down as you Praise ABBA ADONAI? Jericho was a few miles from Jerusalem. As Jesus departed from Jericho, the next stop was Jerusalem and HIS triumphant entry before HIS last Passover, HIS crucifixion and Resurrection. John says in 12:13 that they took branches of palm trees, and went forth to meet him, and cried, Hosanna: Blessed is the King of Israel that come in the name of the Lord. Are you willing to wave a palm branch, a banner, a flag for the King of kings? Hebrews 11:30, proclaims that by faith the walls of Jericho fell down, after they were compassed about seven days. Faith is the persistent, consistent, optimistic belief that GOD will show up! 3. that which determines events: said of either a supernatural agency or necessity. The word predestined is in the Bible only four times and is defined as to determine before, to ordain and to predestine. The 15 characteristics may be applied to our personal lives, our families, our ministries, our cities, our states, and/or our nations. Do you possess the 15 attributes of the City of Jericho? If not, why not? How do you position yourself to be transformed by GOD? All the answers to your questions are found in the wisdom of GOD.